On Sunday, February 10 from 4-7pm, we invite you to attend a Candidate Information Sessionswhere you can hear more about what is involved in serving on the SORO NC Board, meet current Board Members, and have your questions answered. Free and open to the public, the 20th Annual SoRo Festival features food trucks, a live music stage, tree adoption, and over 60 vendor booths highlighting neighborhood businesses, community information and a variety of merchandise. It also offers “Camp SoRo” Kids Zone with attractions, a rock-climbing wall and free arts and crafts for children. It's truly a fun-filled family day in the community and we hope to see you all there. Don't forget to stop by the SORO NC booth and say hello! For more information, visit the SORO Festival website. Solutions to LA's homelessness crisis call for compassion—and urgency. Focused on the tangible, positive actions community members can take at every level, SORO NC's 2016 Town Hall seeks to foster empathy and understanding for a problem that can no longer be ignored. Free underground parking via entrance on Pico Blvd. Please RSVP to secretary@soronc.org (or call 310-295-9920) and plan to arrive early. Doors close promptly at 7pm. Note: This event is now at capacity and we are taking waiting list names at the email above. The Town Hall will include a panel discussion and Q&A moderated by KCRW's Anna Scott with experts and leading elected officials. The event is free and open to everyone, although space is limited and RSVPs are recommended. Download the flyer to share with your neighbors here. Note: This event is now at capacity and we are taking waiting list names only. Volunteer to Clean Up Pico Blvd.! Join Councilmember Paul Koretz, Council District 5 staff, and SORO NC as we help make Pico shine. As they say, many hands make light work, and past cleanups have been loads of fun and a great way to show your pride in SORO. You only have to bring a reusable water bottle and a smile—we'll supply the rest (courtesy of LA's Dept. of Sanitation). Be sure to be there at 9am sharp! Download and print the flyer to help us get the word out. Email paulawaxman@soronc.org to let us know you're coming, and be sure to invite your friends and family! Come celebrate the United Nations's "International Day of Peace" at a FREE neighborhood picnic for the whole family at the Robertson Rec Center, 1641 Preuss (Robertson at Airdrome). Bring a blanket to sit on. For more information, or to volunteer or to contribute, go to peacepicnic.org, or email harsimrank108@gmail.com. 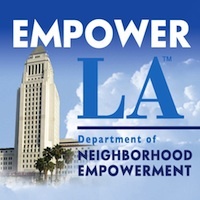 A collaboration of the Robertson Recreation Center, the South Robertson Neighborhoods Council, LA City Councilmember Paul Koretz, LA City Councilmember Herb J. Wesson, Jr., St. Mark Coptic Orthodox Church, and Guru Ram Das Ashram. Join Council President Herb Wesson & SORO NC at a FREE movie in the park! Fun for the whole family! Free hot dogs, hamburgers, popcorn and more! SORO NC is delighted to partner again with Council District 10 and Council President Herb Wesson to bring you a family night out for free! This year marks the ninth successful MOVIES IN THE PARK event with CD10, and we hope you can come out and join the fun. Team Wesson will be prepping in the park all day, and we invite you to join us an hour before sunset (6:30-ish) to grab a hot dog or burger, some popcorn and enter in Council President Wesson's free drawings for giveaways for the kids. Sunset is at 7:30pm and once it gets dark, we'll start the movie on the giant screen. Bring a blanket and enjoy a movie under the stars while summer lasts. Don't forget to stop by the SORO NC table to say hi! "Antic and unexpected...rife with subversive elements, wacky critters and some of the most beautiful landscapes ever seen in a computer animated film."